A foliar feeding of slow release nitrogen during the growing season has been proven to give plants an instant boost at a critical growth stage while also sticking with your crop long-term, continuing to provide critical nutrients to plants as they mature toward harvest. 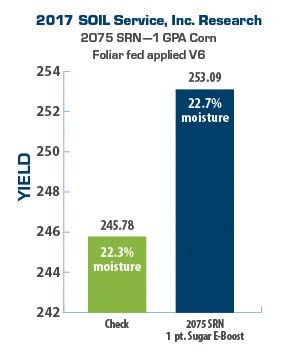 When used in combination with SOIL Service’s Foliar Opp, you have the potential to add 10 to 15 bushels of top-end yield in corn or 5 to 12 bushels for beans. Because both products are effective in corn and soybeans depending on the situation, our experts will recommend the combination that is right for your crop and the current growing season. SOIL Service offers two specialized slow release nitrogen products that we’ve developed and tested. 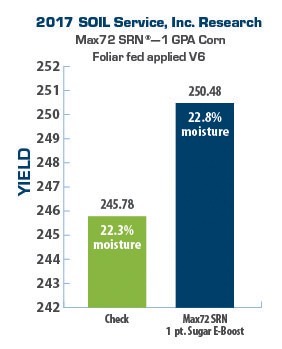 Containing the maximum percentage of slow release nitrogen available on the market—72 percent—our Max72-SRN product is a non-burning solution for use on row crops, turf, vegetables, and fruit. At a rate of one gallon per acre, it offers more than three times the slow release nitrogen of many competing products. Tests have shown Max72-SRN remains available to crops for up to six weeks in the soil and three to four weeks on the leaves. Foliar feeding Max72-SRN minimizes N loss and coats leaves, lasting for weeks while the plant tissue absorbs it. Its staying power makes it an ideal delivery partner for both crop protection chemicals and glyphosate herbicides, keeping these products on the crop or the weed for a longer period of time. When crops need a nutrient boost during the growing season—especially if they have been put under stress from heavy rains, wind, or hail—2075-SRN is SOIL Service, Inc.’s, solution. 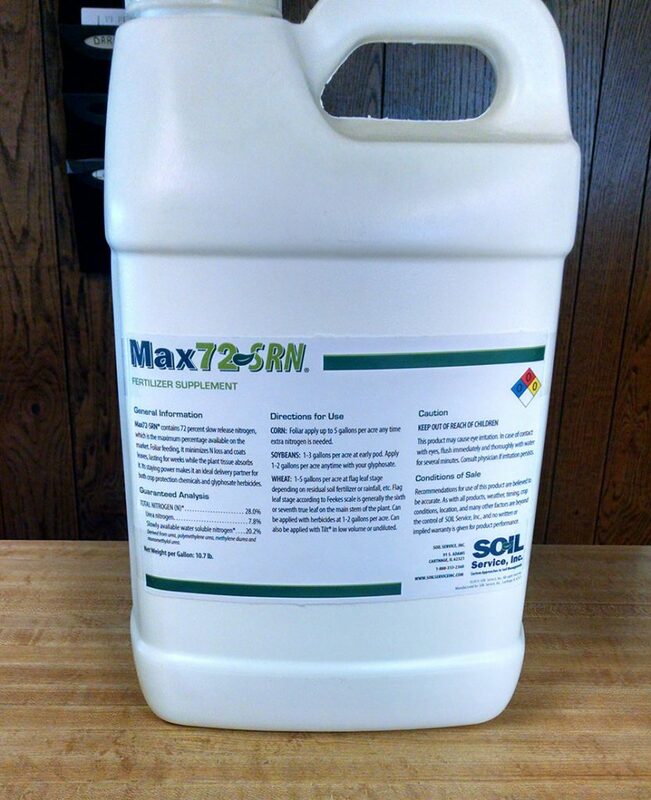 A clear liquid fertilizer using our high-performing Max72-SRN as a foundation, 2075-SRN delivers nitrogen, sulfur, and potassium for crops to absorb virtually any time during the growing season. It can be applied as a foliar spray or via an irrigation system and mixes well with herbicides and fungicides. 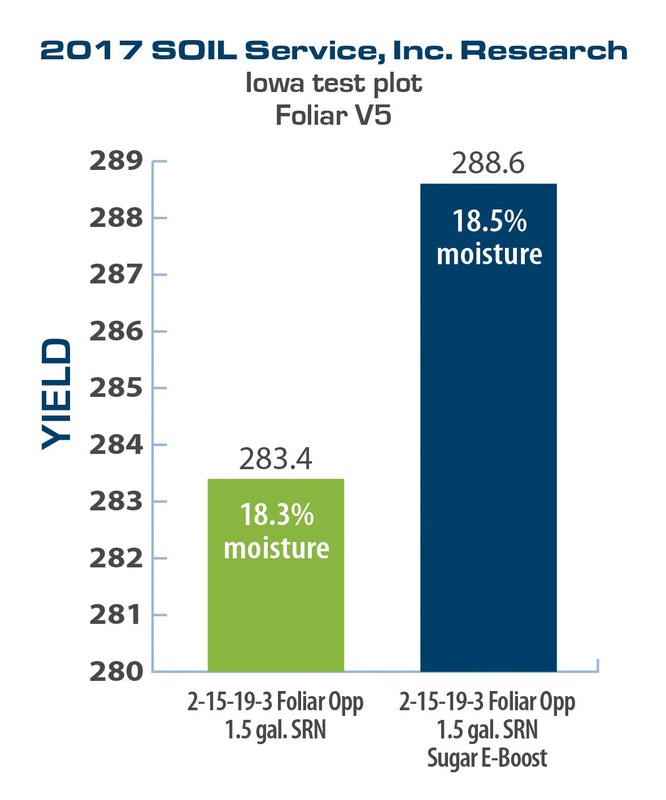 More test results and product data is available for Max72-SRN and 2075-SRN in our slow release nitrogen brochure.